Shelf styling is a beautiful way to add colour, texture and interest to a space, without having to spend a fortune. The trick is to use pieces you already have, add a little new and be willing to move things around. Here are my tops tips to creating a shelfie that is perfectly you. This one is all about contrast. Try varying the height, shape and texture of objects you use and cluster items together to create a group. Place short, round or smaller items in front of taller pieces to create depth. 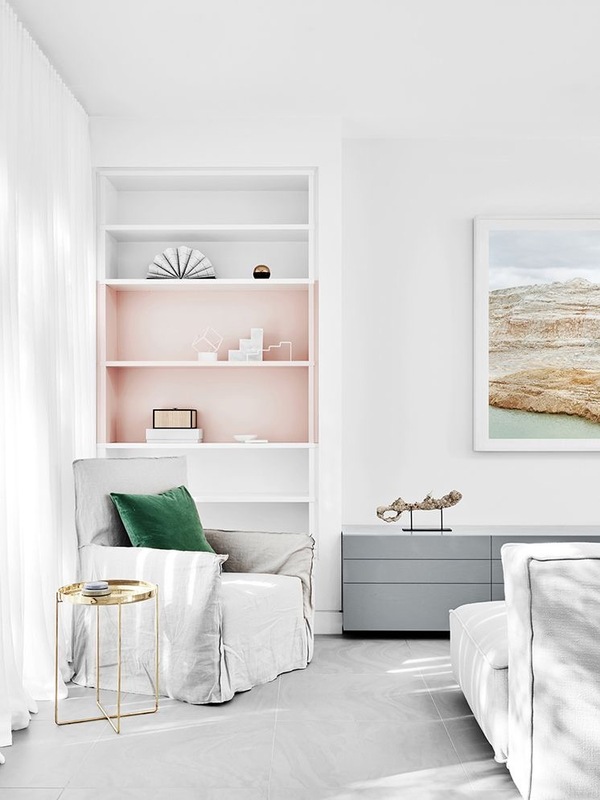 You can do the same with leaning prints and pieces of art – place items partially in front of them to create connection. And don’t be afraid to go large. Too many small items in a row can look bitsy and cluttered. Add books or magazines to create interest and add colour. Show off beautiful spines by displaying them in a stack or vertically. Books also make a great platform for other pieces, such as bowls or vases. Potted greenery in the home has never been more popular. And they make fabulous styling items for shelves, particularly cascading varieties. Any type of greenery, whether it’s a pot plant or a picked stem from the garden in a vase, will add life and interest to your shelves. You don’t have to fill every space. I like to group items together and leave some negative space to create a sense of balance in the overall arrangement. But this is just my personal preference. I love a wonderfully full and busy shelf, as much as a minimalist one. They both work. For example, this shelving in the Carlton apartment designed by Hecker Guthrie, is brimming with personality, greenery and treasures. 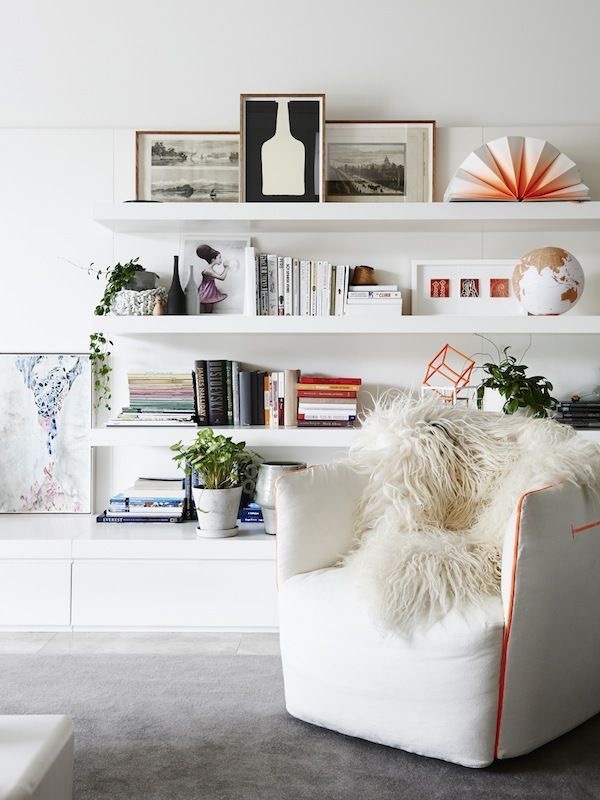 Beautifully full and interesting shelf styling in the Carlton apartment by Hecker Guthrie. Photography by Eve Wilson. This shelving, on the other hand, featured in the Caroline St residence by talented designer Fiona Lynch, is superbly pared back. 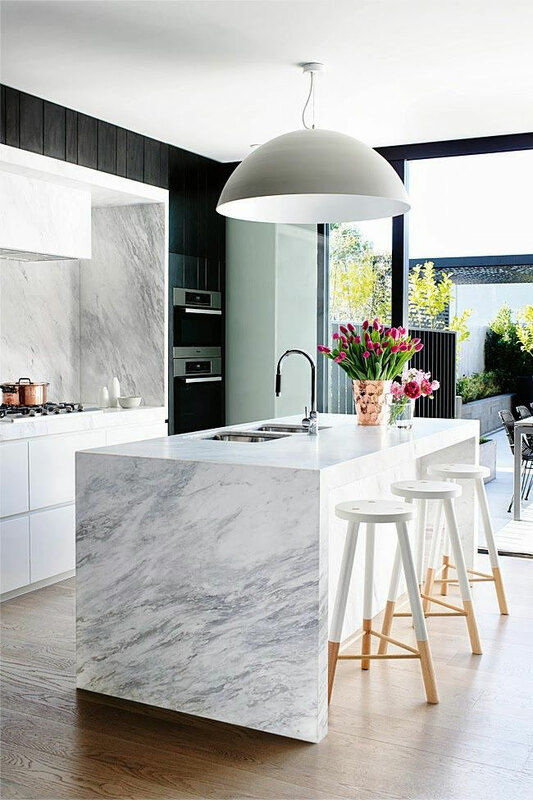 Minimalist styling in the Caroline St residence by Fiona Lynch highlights the beauty of the cabinetry and colour palette. Photography by Brook Holm. Styling by Marsha Golemac. I love both. It all depends on the context of the home, other styling features in the room and, above all, you. Try favourite pieces in new locations and keep moving things around until you are happy. Bring pieces in from other rooms and retire items that have been around for a while. If you get stuck, take everything down and start again, putting back only things you love and adding new. 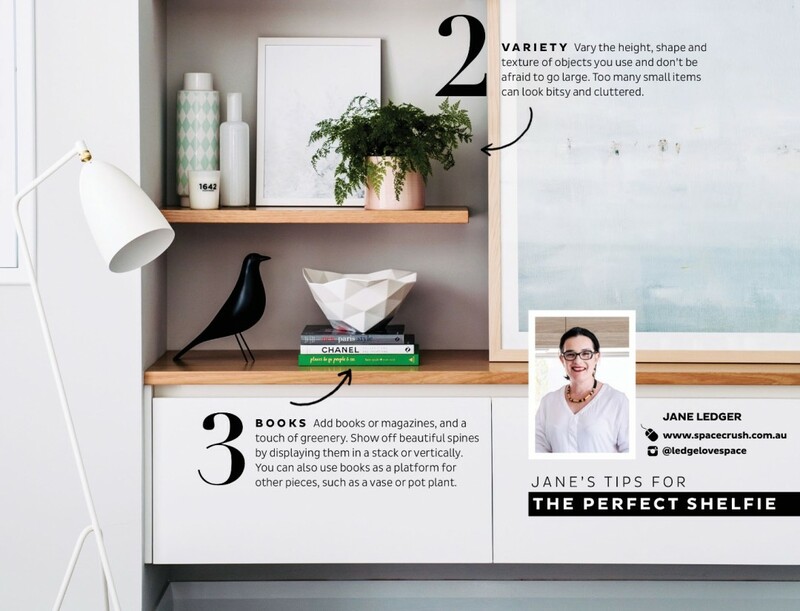 You can see my shelf styling tips in action in the latest edition of Adore Magazine, where I styled up the living room cabinetry of my gorgeous client, Jenni Farr. Jenni picked out her favourite pieces (from a very large and impressive collection I have to say!) and let me loose on her living room shelving. What’s important is that you include things that mean something to you – this doesn’t necessarily mean going out and buying the latest on-trend items. 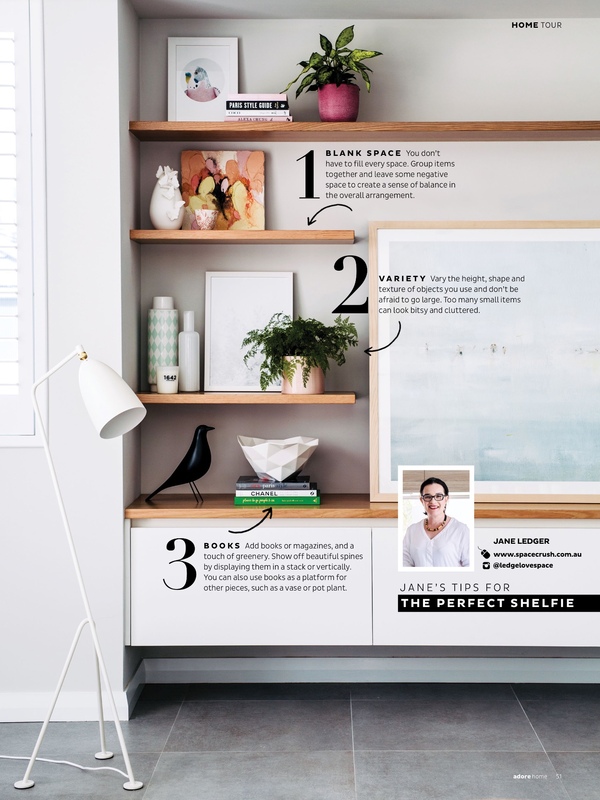 Here, Jenni’s shelving includes a specially commissioned art work by Lisa Madigan, a much-loved vase, as well as new pieces from her favourite homewares stores.